We’re a not-for-profit, user-led voluntary organisation, and we work hard for our members just because we think raising awareness is important! As a charity, we’re led by our management committee and the Voting Members who help make decisions. 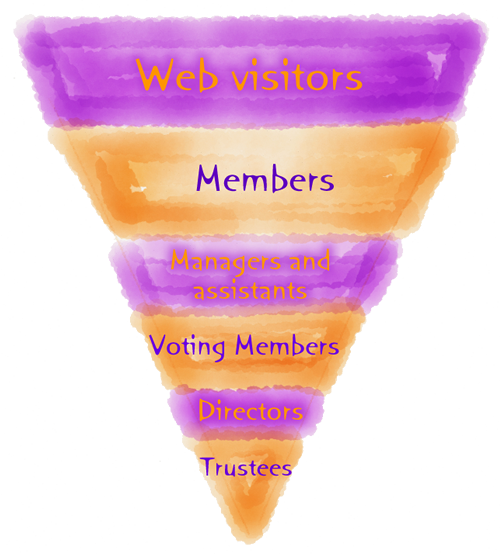 But as you can see from our organisation structure triangle, everything we do is for our web visitors and thememberswho join and follow LifeSIGNS. Our members drive everything we do, and include those who have joined our mailing list, our Support Forum and our social media outposts, like Twitter, Tumblr, Facebook, YouTube, and LinkedIn. Several of our members contribute to LifeSIGNS by writing for us, or raising funds and awareness with us. Managers and assistants manage many of the social network and support channels LifeSIGNS runs, and help make LifeSIGNS the most active national charity dedicated to self-injury awareness. Everyone at LifeSIGNS is an unpaid volunteer – so we really appreciate the time, energy, and experience our Managers and assistants bring to our work. Voting Members help the Trustees and Directors make decisions by raising questions and actually voting on big decisions. Any adult can become a Voting Member, and every Manager, assistant, Director and Trustee is also a Voting Member by default. Directors manage and lead our organisation on a day-to-day basis, and work to develop the LifeSIGNS approach to self-injury and the impact of our organisation across the UK and beyond. Every role, as mentioned above, is a voluntary role; no one gets paid at LifeSIGNS. 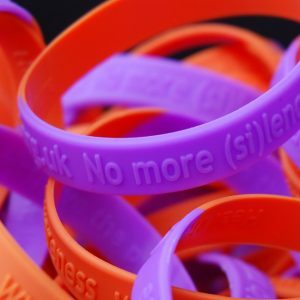 LifeSIGNS (Self-Injury Guidance & Network Support) is an online, user-led charity, founded in 2002 to raise awareness about self-injury and provide information and support to people of all ages affected by self-injury. We recognise self-injury is a way of coping with distressing experiences and difficult emotions, and we encourage people to reflect on the issues behind their self-injury, and to develop and explorealternative coping mechanisms.